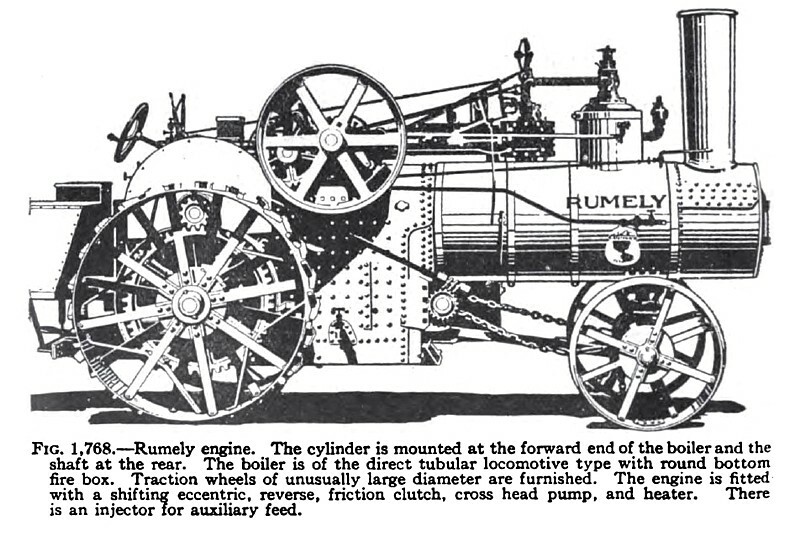 Manufacturers Index - Advance Rumely Co.
M. & J. Rumely was founded in 1853 by brothers Meinard and John Rumely. They began making threshers in 1857 and steam engines shortly thereafter. Meinard bought out his brother in 1882 and renamed the company. The M. Rumely Company, LaPorte, Ind., has increased its capital stock from $3,000,000 to $22,000,000 through reorganization and the merger with it of Gaar, Scott & Co., Inc., Richmond, Ind., and the Advance Thresher Company , Battle Creek, Mich. The three companies are manufacturers of threshing machinery. The capitalization is larger than that of any other manufacturing concern having its headquarters in Indiana and the consolidation makes the new company the third largest threshing machine company in the world. The capital stock is divided into $12,000,000 common and $10,000,000 preferred. The M. Rumely Company was established in 1853 with $250,000 capital; Gaar, Scott & Co. in 1836 and the Advance Thresher Company in 1885. The total assets of the new company are given by the appraisers at $21,281,306, of which current assets are $16,177,784. The three plants employed about 4000 men. In 1912 they then acquired the Northwest Thresher Co. The company was acquired in 1931 by the Allis-Chalmers Manufacturing Co. Incorporated under Indiana laws, December 14, 1915, for the purpose of acquiring the business, property and assets formerly owned by the M. Rumely Company and its subsidiary companies. The M. Rumely Company was incorporated under the laws of Indiana, December 5, 1887, succeeding a business established in 1853. The company’s business consists of the manufacture of agricultural implements, such as threshers, separators, hullers, etc., and in adapting the use of the steam engine for plowing purposes. It also manufactures a new type of internal combustion engine, primarily for plowing purposes, using kerosene and the heavier oils instead of gasoline and the other expensive fuels The_company’s plants are located at La Porte, Ind., Toronto, Canada, and Battle Creek, Mich. In 1911, they acquired the properties and business of the Advance Thresher Company, established in 1885, and Gaar, Scott & Co., established in 1836, and in November, 1912, of the Northwest Thresher Co. , of Stillwater, Minn.; also operates plant of American-Abel Engine & Thresher Co., Ltd. (now Canadian Rumely Co., Ltd.), of Toronto, a Canadian corporation, acquired in 1902, by interests allied with Advance Thresher Co.
Officers: Finley P. Mount, Pres. ; J. Abrams, Vice-Pres. ; W. I. Ballentine, Vice-Pres. ; A. H. Berger, Vice-Pres., Compt. and Sec. ; J. R. Kohne, Treas. ; E. M. Thomas, Asst. Comptroller. Directors: Finley P. Mount. W. E. Taylor, Maurice Fox, Lucius Teter, J. A. Patten, R. G. Hutchins, Jr., Howard Coonly, Stephen S. Stratton C. McK. Lewis, J. W. O’Leary, Ralph Van Vechten. Annual Meeting: Second Monday in April.